YOUNGSTOWN, Ohio – After an eight-hour day of work, Christie Galazia looks forward to being home, picking up her paintbrushes and working on a canvas. But this wasn’t always the case. Galazia – who received a degree in art history from Youngstown State University in 2011 – stopped creating art until about a year ago when her fiance encouraged her to paint a piece for an art show at the Soap Gallery in downtown Youngstown. The art show, which took place Nov. 2, included work from community residents who struggle with addiction or mental health. Funds raised from the event benefited the Helms Foundation, a 501(c)3 nonprofit, and Potential Development, a charter school for students with autism. For Galazia and other local artists, creating art is more than a hobby. But if you were to search for art-therapy programs under services that the Mahoning County Mental Health & Recovery Board offers, you’d find none. This is why the founder of the Helms Foundation, Terri DiGennaro, and the county recovery board’s executive director, Duane Piccirilli, are advocating the hiring of an art therapist. 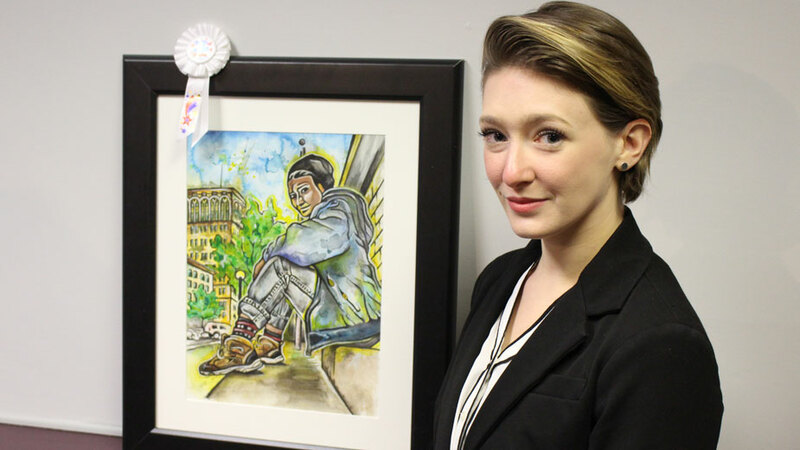 Pictured: Christie Galazia received third place at the Helms Foundation art show in November for her watercolor painting of herself in downtown Youngstown. For Giambattista, who worked as a postal carrier in Sharon, Pa., street art was the passion in his life, his mother says. “He brought color and life back to several blighted buildings and bridges throughout the area,” she says, and he used HELMS as his signature, or tag, although no one is sure what the letters stood for. On July 10, 2015, Giambattista fell from the edge of the Pittsburgh & Lake Erie Railroad Gateway Yard building in Struthers while he worked on one of his pieces and lost his life. Following his death, DiGennaro and her family received contributions “out of the graciousness of people,” she says, and she decided to form the Helms Foundation to pay the generosity of the community forward and to honor her son. Initially, DiGennaro donated part of the money to the Butler Institute of American Art and to the local chapter of the National Alliance on Mental Illness, or NAMI, to fund art classes and hold an annual art show for those in the program. After funding two years of programming for NAMI, Bill O’Rly of the Soap Gallery asked the foundation to host its third art show there, in a bigger venue, and allow other artists to participate outside of the NAMI program. DiGennaro reached out to Piccirilli and asked if the county knew of any artists involved in its programs who would like to turn in pieces for the show. That’s when she learned that the county didn’t have any art programs. Lack of awareness is one reason why the Mahoning County Mental Health & Recovery Board didn’t consider adding an art therapist to its programs. Another is funding; the county can only afford to cover half of the cost to employ such a specialist. “A lot of the art therapists that come out [of college] have dual masters degrees. They have to be an art therapist and a counselor or social worker, because the latter part of it is the billable part,” DiGennaro says. The art show in November had close to 70 participants and raised more than $20,000. Helms donated part of the money to Potential Development for a designated art room. The rest will help to bring art therapy programming to Mahoning County and fund more art shows with NAMI. 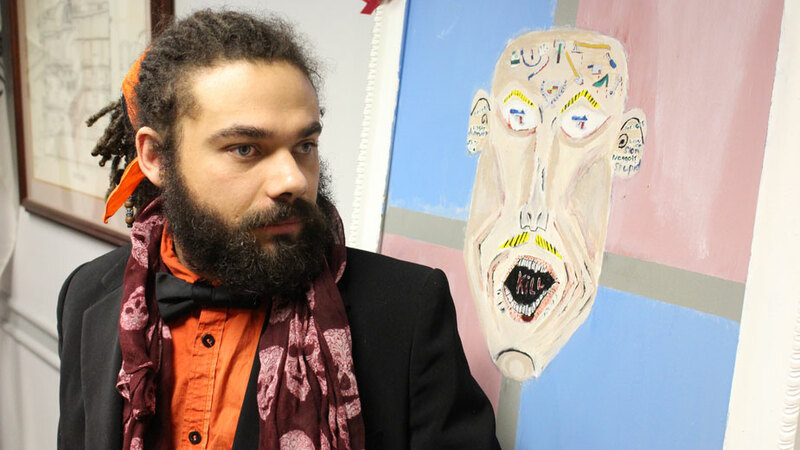 Pictured: Josh Ford received second place at the Helms Foundation art show in November for his painting of a man turning to violence to deal with the pains of life. For Josh Ford, a 26-year-old Youngstown resident, being able to produce art helps him in many ways. Ford won second place for his artwork at the show. His painting depicts a man who is hearing negative words spoken to him and turning to violence to deal with the pains of life. Ford was presented with his award Feb. 21 at the Mahoning County Board of Commissioners meeting, where DiGennaro discussed the Helms Foundation mission to help bring art therapy here. Pictured: Helms Foundation founder Terri DiGennaro and Mahoning County Mental Health & Recovery Board Executive Director Duane Piccirilli hold a photo of Ryan Giambattista’s Helms tag, which is seen on buildings throughout the area.